Cost/Amount: USD$5.00 for 1.2 grams. Sample baggies also available at $1.00 per baggie. In the late 1990s, you could walk into nearly any hardware store and buy "oops paint" - custom mixed paint that people had returned for one reason or other, that the store couldn't really sell to anyone else. These sections were a great place to find interior paint, if you were a little flexible with the exact color. Some time in the 2000s, hardware stores quietly stopped selling their "oops" paint - possibly because a lot of decorative painters and beginning faux finishers were coming in and buying those to speckle their walls, instead of buying the regular-priced products. Aromaleigh v1 also found a way to make their color experimentation work as a business-plus: first by sending samples of these colors with folks' orders, and then (when customer demand for these colors got really intense) by numbering the batches of happy accidents and selling them in sample and fullsize under the "Le Mystere" banner. 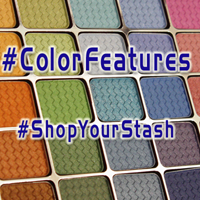 The colors have numbers rather than names; but they can be nice additions, and cost less than most regular Aromaleigh v1 eye colors.